This article is about the term, "Light". You may be looking for the song Hikari. "The heart may be weak, and sometimes, it may even give in. But I've learned that deep down, there's a light that never goes out!" Kingdom Hearts is the source of all light. Light is a force parallel to darkness, a strong element used in Synthesis items, and may also be used as an attack in the Kingdom Hearts universe. Although often associated with the forces of good, light is not entirely benevolent; for example, Xemnas uses Roxas's power over light against Sora and Riku in his last stand. The Realm of Light is also one of the three known realms in the Kingdom Hearts universe, along with the Realm Between, and the Realm of Darkness. Before the Keyblade War, the five Unions collected Lux. Master Xehanort reveals to Terra, Ventus, and Aqua that the Keyblades found in the Keyblade Graveyard are the remnants of Keyblade wielders that fought in a legendary battle known as the Keyblade War. This war took place between the forces of light and the darkness. Light is also revealed to be one of the two forces required to create the χ-blade. The weapon is born from a conflict between equal forces of light and darkness. Vanitas, a being of pure darkness, is able to create the χ-blade after battling Ventus, a being of pure light. Ventus's light is equal to Vanitas's darkness since Vanitas is the embodiment of Ventus's extracted darkness. 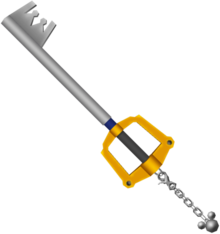 A Keyblade, used by chosen wielders of light. In Kingdom Hearts, the roles of light and darkness play very typical roles as in most games, with light being the force of "good" and the protagonists, and darkness being an evil, opposite force used by the antagonists. Since the Keyblade is a light-affiliated weapon and the entire quest is about closing the Door to Darkness and eliminating the Heartless, the entire story is very biased in a light direction. One important belief about light is that there is always "a light in the deepest darkness". This plays a role many times in the story, including when Sora opens the Door to Darkness and finds a blinding light inside with King Mickey. Even through all of the bias towards light, it is still a balance with a closed Door to Light and a closed Door to Darkness. In Kingdom Hearts Chain of Memories, light does not play as much of a role in Sora's game, since the main enemy is Organization XIII, who are not beings of darkness. The most significant story development about light in the story is Riku's constant struggle throughout the game between him and the darkness in his heart. He tries to shun the darkness and Ansem, Seeker of Darkness out of him, but he cannot do it. Because of this, Ansem taunts him that darkness is his destiny. There are many times when Ansem almost completely plunges Riku into darkness again, but he is always saved by King Mickey's light. Riku finally experiences an epiphany when he talks with Naminé (disguised as Kairi) after being confronted by Zexion, in the guise of Sora, who blinds him with light. Riku finds that darkness is not evil, and he should use it along with light to help defeat his enemies and give him more power. This changes Riku, and Ansem, thinking that Riku has turned to the darkness, mockingly tells him that he was right about Riku's destiny. Riku fights Ansem and destroys him. At the end of the story, DiZ asks Riku which path he wishes to take. He decides to take the road to dawn, a path leading from darkness to light. Both Roxas and Xion have the ability to use light in battle, since they are both ultimately derived from Sora. This is most noticeable in their Limit Break, Event Horizon, in which their Keyblade is shrouded in light. In their Final Limit, they also release pillars of light. Two other characters, Riku and The King, also have the ability to use light in their Limit Breaks and Final Limits. Riku's weapon is engulfed in light during his Final Limit, and The King's Limit Break releases bursts of light. Sora, Roxas, King Mickey, and Riku use the power of light. After Xemnas absorbs the remains of Kingdom Hearts, he uses both the powers of light and darkness in his final battle against Sora and Riku. The Door to Light opening. Light can also be manipulated into attacks by some beings within the Kingdom Hearts universe with a strong affinity for it, most notably being Sora and his Nobody, Roxas. Similar to members of Organization XIII's usage of their respective elements, these two are able to physically call and wield the element of light. Roxas's light powers, however, are significantly more advanced than Sora's; he is capable of creating spears and force fields out of light. Sora only seems to be capable of using it to augment a select few of his combo finishers, such as Explosion. However, he also can call to his power of light in his Final Form, during which he can use fighting techniques similar to Roxas's. Ventus also shows to have an affinity for light-based attacks. He can use several light-based commands like Salvation and Faith, and his ultimate Finish Command, Stratosphere, combines both light and wind into a devastating attack. Aqua also uses light in the four variations of her Deck Command Magic Hour, in where she sends orbs of light spiraling upwards. Also, during the Final Episode of Kingdom Hearts Birth by Sleep, Ventus's sleeping form is able to summon his Keyblade and open the Door to Light, leading himself and Aqua back to their home of Land of Departure. Sora's Keyblade, Kingdom Key, is a light-aligned Keyblade. Other notable light-aligned Keyblades are Destiny's Embrace and Way to the Dawn, used by Kairi and Riku, respectively. On multiple occasions throughout the Kingdom Hearts series, characters have been able to wield light in unique manners not similar to those above. Most notable are the Princesses of Heart, who are able to use their inner light to help those in need. For example, after Sora sacrificed himself and became a Heartless in Kingdom Hearts, Kairi used the light in her heart to turn Sora to back to his original form. In Kingdom Hearts II, Sora is able to open the "Door to Light" in the Realm of Darkness, at the Dark Margin. By using the light in his own heart, Sora was able to return himself and Riku to Destiny Islands. Although she is not a Keyblade wielder or Princess of Heart, Queen Minnie has control over light; when she assists Sora during the Heartless invasion of Disney Castle, they can perform a Reaction Command in which a beam of light falls on her, and releases a shockwave of light; she also occasionally casts "Pearl". Ragnarok: Used by Sora in the original Kingdom Hearts, it releases a flurry of light-based magic in the form of laser-like beams. It is also used similarly in Birth by Sleep as a Shotlock for Terra, Aqua, and Ventus. Ars Arcanum: Used by Sora in Kingdom Hearts, Sora covers his Keyblade with orange-hued light and slashes a devastating combo. Ventus uses a similar ability in Birth by Sleep. Explosion: Used by Sora as a combo finisher in Kingdom Hearts II, three light orbs spin around Sora, grinding into the enemy, then repelling them. In Kingdom Hearts: Birth by Sleep and Kingdom Hearts Re: Coded, it is an slam towards the ground that causes a shockwave of light. Trinity Limit: Used by Sora in Kingdom Hearts, a different version is used by Sora, Donald, and Goofy in Kingdom Hearts II. In Kingdom Hearts, Sora points his Keyblade straight into the air, which begins glowing. Then, he jumps up and sticks the Keyblade into the ground as a strange symbol and four orbs of light appear around him. He twists his Keyblade into the ground in an unlocking motion as light bursts from the orbs, damaging all enemies in sight. In Kingdom Hearts Chain of Memories, the attack is extremely similar to its form in Kingdom Hearts. In Kingdom Hearts II, the final move of Trinity Limit is for Sora, Donald, and Goofy to raise their weapons as an orb of light is created above them, blasting all enemies. Finishing Leap: Used By Sora in Kingdom Hearts II, Sora leaps into the air and strikes the ground, creating a burst of light and launching enemies into the air. Holy: Used by Sora in Kingdom Hearts Chain of Memories. Salvation: Used by Ventus in Kingdom Hearts: Birth by Sleep and Sora in Kingdom Hearts: Dream Drop Distance. Faith: Used by Ventus in Kingdom Hearts: Birth by Sleep and Sora in Kingdom Hearts: Dream Drop Distance. Holy Burst: Used by Riku and Mickey in Kingdom Hearts Re:Chain of Memories. Riku and Mickey stand back-to-back while firing orbs of lights. Riku and the King using Holy Burst. Inverse Burst: used by Riku and Mickey in Kingdom Hearts Re:Chain of Memories. The ability can only be activated if Riku is in D-Mode. The move is the same as Holy Burst, but Riku fires dark orbs instead of light ones. Light Shields: Used by Roxas during his battle against Sora in Kingdom Hearts II Final Mix, and by Data-Roxas during his battle with Data-Sora in Kingdom Hearts Re:coded. Thirteen of them can be called up at any one time and Roxas uses them in different ways, from mixing them into his Keyblade attacks to rushing across the field with the shields charging alongside him. Pearl: Used by King Mickey, it shoots a homing orb of light at the enemy. In Kingdom Hearts Re:Chain of Memories, it is used along with Riku for the sleights Holy Burst and Inverse Burst. Event Horizon: A Limit Break that can be performed by either Roxas or Xion in Kingdom Hearts 358/2 Days. This attack consists of the Keyblade covered in an aura of light and beginning a powerful combo. The Final Limit calls down elegant pillars of light which can strike enemies from a long distance away. Magic Hour: A Limit Break that can be performed by Roxas while dual-wielding Oathkeeper & Oblivion in Kingdom Hearts 358/2 Days, and Data-Roxas in Kingdom Hearts Re:coded. This attack has Roxas float in the air causing beams of light to appear and striking enemies, dealing heavy damage. In Kingdom Hearts II Final Mix, Roxas uses a different type of Magic Hour, instead of firing random beams of light, he fires a bunch of homing-light orbs, similar to Mickey's Pearl. Darkstrom: Riku's Final Limit envelops his weapon in light as he strikes enemies with an elongated blade; can only be used in Kingdom Hearts 358/2 Days. Holy: The King's Limit Break in Kingdom Hearts 358/2 Days is entirely based upon light bursts from The King, in the forms of orbs and rays. Burst of Faith: Used by Mickey when paired with either Ventus or Aqua in Kingdom Hearts Birth by Sleep. Similar to Holy Burst, however, in place of the orbs of light is a shower of lights; the finishing move sends out a burst of light. Brave Shot: Sora slams both Keyblades into the ground. Doing so creating a burst of light that races across the ground, knocking enemies into the air. Sonic Strike: Sora completely coats one of his Keyblades in light and rushes forward through the air, spearing enemies. Wisdom Shot: Wisdom Form's main attack is to shoot bullets of light magic that slightly home in on their targets. Disaster: Sora is surrounded by light and draws enemies into him by rotating. It builds up until it releases the enemies in a blast of light. Final Arcana: Sora hooks his Keyblades together and throws them like a boomerang across the field, then splits them apart and clashes them together summoning damaging bursts of light. Final Arts: Sora spins the Keyblades together in mid-air then has them move around him slashing up and down repeatedly, light coming out of both ends. He then spins, holding the Keyblades to the soles of his feet, and then dives down to the ground in a protective barrier of light. Ars Arcanum: Sora's Keyblade begins to emit a light, and he begins a fast-paced combo attack. Ragnarok: Sora begins a combo attack while lifting into the air, then shoots multiple light projectiles at enemies. This page was last edited on 20 March 2019, at 20:48.